You’ve probably heard of the farm to table movement and the importance of supporting local foods. The term ‘shop local’ has become the calling card for anything environmentally friendly. We preach it as the best alternative to buying from big brand name locations such as Costco or Target. Have you ever given any thought to just how important local providers are though? Buying and supporting local providers can make a huge impact on not only our environment but local economies as well. This is the mentality that stops us from taking steps forward to preserving our community and our atmosphere. This idea of having to choose between convenience and our conscience. Here’s the real root of the issue: people don’t know where to start when it comes to shopping local. What does shopping local even mean? So what’s the solution? Well, we get educated. Sure, it may be easier to stock up the office or home with big brand name items from wholesale providers like Costco. But we can reap more rewarding outcomes while keeping our shopping at the same level of convenience. Still considering why your next office run should include locally sourced food and beverages? We’re here to break it down for you all. If someone were to say, “Give me five reasons why I should buy local,” what would you say to them? Admit it, most of you wouldn’t be able to come up with an answer to that question. Whether you’re searching out of personal interest or on behalf of the office kitchen that needs restocking. Shopping local is not just about shopping at a farmer’s market or buying brand names from the surrounding area. Yes, there are benefits to shopping from smaller independent businesses, but there’s so much more to it than that. Shopping local has become a trend. It’s become a movement even. Shopping local has become the motto for embracing a mindful lifestyle, culture, and mentality. Let’s dig a little deeper here and analyze some other implications for shopping local. The word ‘local‘ can be very loosely defined. According to some sources, anything within a 100-mile radius can define local. Here in the bay area, our frequent farmer’s markets can attest to our commitment towards locally sourced goods within 100 miles. On the other hand, larger grocery store chains will claim that local can mean anything within a 450-mile radius. And rather than labeling something as local, they will label it as regional instead. Which brings us to our next subject: is there another way that consumers can define local? Aside from geographic proximity, one way that consumers can define local is by the amount of processing that goes into the product. Notice that most everything from large chain stores is processed, packaged, and treated with chemicals we can’t even pronounce. And often times this processing occurs in parts unknown outside of that 100-mile radius we talked about earlier. Yet, any goods produced locally will look and taste more like real food without all the plastic wrap. This goes to show that what some will consider local to be, depends on where their food is grown. So if your potatoes are grown on a farm 20 miles from your home, then that can fall in the ‘local’ category. Now take coffee for example. The best coffee usually comes from parts around the world. But what if those same coffee beans that come from South America or Africa are roasted in a city 50 miles from your location. Would you still consider that local? Let’s continue with our coffee example. How would you label the final product? Say the company is local to you. Everything they do from their production to their packaging is locally done. Their final products (in this case their coffee) however, are produced with imported inputs. Your choice then lies in deciding whether to count the business or the product as local. Don’t think of this as an all-or-nothing situation. Just because the product isn’t entirely local doesn’t mean you can’t support the local business. If they have standards set in place that promotes sustainable practices then, by all means, count them as local and preach them as wholesome. All we’re saying is that there’s more to shopping local than location or distance. Shopping local can also mean supporting local businesses that in turn support their environment. Our understanding of local food systems and their impact is ever increasing. There is a growing interest in local food systems that goes beyond even the motivation of proactive individuals. 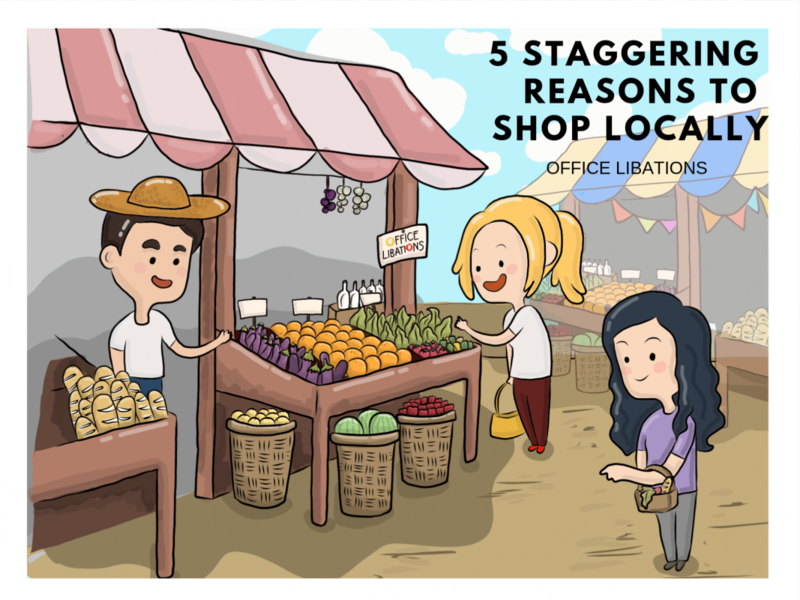 No matter what local means to you, let’s take a look at why you should start doing your shopping within local limits. There are two ways in which spending on local food can benefit our health and nutrition. One of them depending on the locality of where our food comes from. Local foods retain their freshness for a longer period of time. As a result, they tend to have a higher nutritional value due to the shorter travel distance from the farm to the consumer. Local farms also tend to be closely tied with organic products and practices. Another factor that plays into the health benefits of shopping local is the availability of healthy food items. The more local food there is, the more available it becomes to surrounding communities. It’s no surprise that there is a huge economic impact on shopping locally. The development of local markets means more people are spending their money closer to home. Thus, more money stays within local communities and in turn, goes towards upholding local economies. This concept is known as import substitution. The idea is that, by spending on local businesses, this will generate more sales in a particular area. This increase in revenue then falls into the laps of other local people and businesses in the form of increased income. With an increase in income, they’re able to pour their extra money back into the local economy and the cycle repeats itself once more. In regards to small farms and farmers, the majority are located in the Northeast region of the US and the West coast. Small local producers and farmers gain a larger percentage in profit by selling directly through consumers and skipping the middleman. Otherwise known as wholesale retailers and large chain stores. Of the 84% percent of small farms located near metropolitan areas, 89% of their income derives from direct sales with consumers. Meaning, if it weren’t for the expansion of farmer’s markets, small farmers and producers will cease to make any kind of livable income. A key factor to point out here is the concept of food miles and distribution costs. The issue is not so much the distance that food travels. Instead, we should be looking at the negative effects that occur in all stages of the manufacturing and distribution process. And by negative effects, we’re talking about greenhouse gas emissions, pollution, and wasted energy usage. This is why life-cycle assessments are an excellent way to determine if a product is environmentally friendly or not. According to an Economic Research Report by the USDA, local and regional food systems tend to be more efficient in their use of energy. They use little to no pesticides, travel distance is shorter, and their products are much less processed. Therefore, resulting in a better choice for reducing the harmful effects on the environment. We’re all about community here at Office Libations. Which is why we partnered with our favorite local vendors in the bay area to bring you the best products we could possibly offer. Shopping from local businesses not only gives you more customized service, but it offers a more personal interaction. If you’ve got a party or an office to cater, wouldn’t you feel better ordering products from a business who knows you by name rather than being client #1,396? Plus, ordering from local businesses adds a unique flair to the community. You’d be surprised by how many local businesses produce one-of-a-kind products that you can’t find anywhere else. Why Does Shopping Locally Matter? Shopping local is about developing awareness around what you buy. It means becoming mindful about what you buy and where you buy it from. We as consumers are no longer lying in wait for the right time to do the right thing. We’re taking action, seeking out the best way to enact change for the well-being of our communities and environment. We need not limit our options to locally derived goods. Rather, when the opportunity to shop locally presents itself, we ought to roll with it. When we change our mindset, we change our actions. So next time you hear the phrase ‘shop local’ think of it as another way of saying ‘shop consciously’. It’s a mentality and a lifestyle worth embracing for the betterment of our well-being.